Hi there! Today we're sharing sneaks of My Favorite Things January Card Kit called Yay for You! It's a fun and versatile kit, I know you're going to love it! I made a new baby girl card combining the kit and the LLD Bundle of Baby Clothes Die-namics. I created the cloud panel using the Cloud Stencil with the Premium Cotton Candy Dye Ink. I stamped the sentiment from Yay for You stamp set (kit) with Razzle Berry Premium Dye Ink. 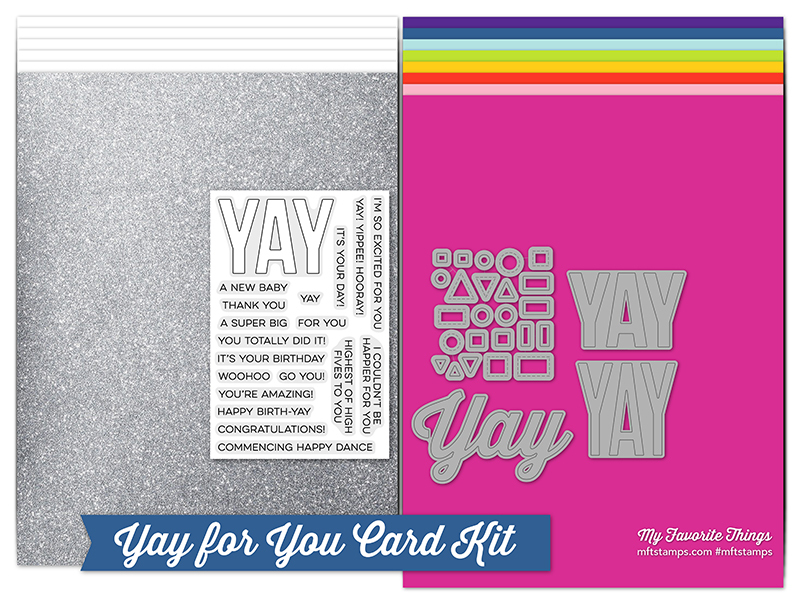 I die-cut Cotton Candy Sparkle Cardstock with the word "YAY" die-manics (kit). The baby clothes, clothesline, bows, and the clothespins were die-cut with LLD Bundle of Baby Clothes Die-namics using the Smooth White cardstock, Razzle Berry and white polka dot pink pattern paper from the Party Patterns Pack. I adhered the cut A2 panel of white polka dot pink pattern paper to a top folding card base. Then, I mounted the cloud panel on top with Foam Mounting Tape. To the cloud panel, I glued on the clothesline and the bows and mounted the rest of the elements with foam tape as shown. To finish, I glued on some Pretty Pink Posh 4mm and 6mm Sparkling Clear Sequins. Make sure to visit MFT Blog for more details on the Yay for You January Card Kit and to see amazing inspiration using this kit from the participating team members. Such a cute card! I love the clothesline idea for the sentiment, as well as the soft pinks mixed with the razzleberry throughout the design! This is so sweet!! Love the colors and the beautiful cloudy background!! The card is so adorable. How sweet! Adorable baby girl card! Love this YAY! So cute. Great idea for a baby card. Sweet! Love the shades of pinks and the cutie clothesline! Super cute baby card - love it! This is so cute! What a clever way to use the kit! What a super cute baby card! Love the cloud background!